Reed is a twenty something young man living in Ashland. Though I have known his mother, Martha, for years, for some reason or another, I have never met Reed. Martha recently saw an article about my pie project and sent me an email in which she told me that Reed and I have pie baking in common. It seems that when Reed was in the 5th grade he participated in the after school ski program and became enthralled with skiing. Martha knew that this hobby would cost money and she talked to Reed about how he might earn that money. Since Reed liked baking, it seemed natural to create the “Ski Pass Pie Company.” Prior to the ski season, beginning in October, Reed would pre-sell pies to his friends and neighbors and then deliver them hot from the oven to their doorsteps. In this way, he raised the money for his ski pass and the occasional piece of ski equipment. Reed ran his pie company for five years and then passed it on to his sister. Through that business experience they both learned lifelong skills. Among them: how to work with people, food preparation and cleanup, and sales techniques. And they had fun and learned to ski as well! Martha said that she told the kids that if they can bake a pie, they can probably do anything. Perhaps that’s true. Over the past few months, I’ve learned a few things about pies. The first is that pie baking is not easy for everyone. It wasn’t always easy for me either, but after hundreds of pies, I got better at it. The second thing I’ve learned, is that when people get a pie, they (often) become happier. They know that someone has spent some time and effort on their behalf. And unfortunately, we are all so busy that this practice is not as common as it might be. 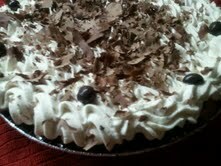 This afternoon, I brought a Chocolate Cream Pie to Reed’s house, but he was not at home. His younger sister accepted it for him and said that she knew that Reed would be glad to receive it – seems that she knows that giving a pie is a way of showing a person that you care. And that’s what this mission is all about.